TAMPA, Fla. -- Notre Dame is heading back to the women's national championship game thanks to a timely putback from an unlikely source. Madison Cable's only basket of the game lifted Notre Dame to a 66-65 victory over Final Four newcomer South Carolina in the national semifinals on Sunday night. 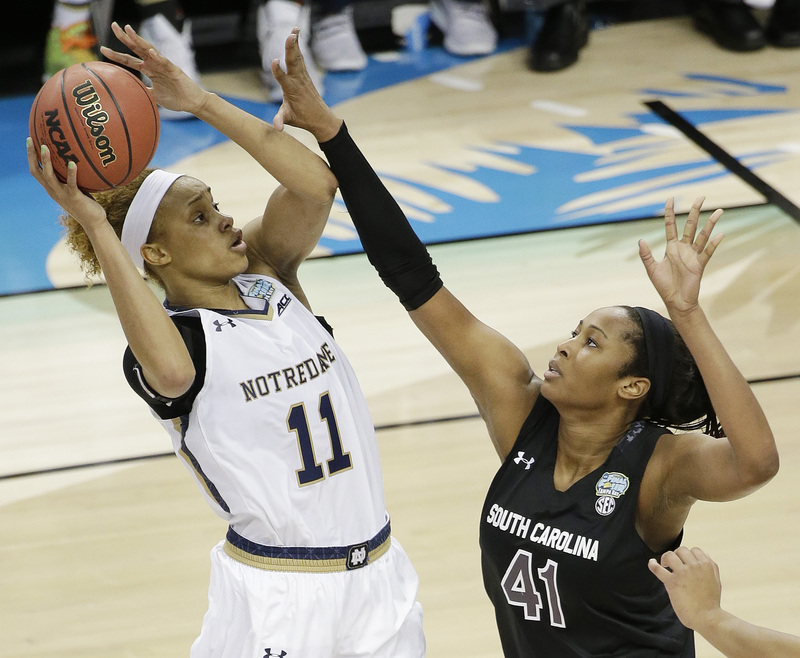 All-American Jewell Loyd scored 22 points as the Irish (36-2) advanced to the NCAA championship game for the fourth time in five years, surviving a scoring drought that lasted more than seven minutes down the stretch. "We didn't rebound, missed a bunch of shots," said Notre Dame coach Muffet McGraw. "Just a great basketball game. We went to Jewell. She had to do everything. Everyone contributed." The Irish have not been able to win it all since McGraw led them to their only national title in 2001. Loyd said no one boxed out Cable on her game-winning basket, adding: "She's done it all year. She's the MVP." South Carolina (34-3) overcame a 12-point, first-half deficit and did it again in the closing minutes. The feisty Gamecocks used a 13-0 run to take their only lead on Aleighsa Welch's offensive stickback with 1:12 remaining. Brianna Turner scored 17 points and grabbed eight rebounds before fouling out for Notre Dame. Taya Reimer had 16 points for Notre Dame. Freshman A'ja Wilson came off the bench to lead South Carolina with 20 points. She scored 10 straight for the Gamecocks at one point in the second half to keep her resilient team within striking distance. Notre Dame led 64-52 with 7:51 to go. The Irish missed eight straight shots before Coates wiped out South Carolina's short-lived lead. South Carolina All-American Tiffany Mitchell's off-balance 3-point attempt bounced high off the backboard as time ran out on the best season in school history. Notre Dame lost to Connecticut in a matchup of unbeaten teams in last year's title game. The Irish came up short against Texas A&M in 2011 and Baylor in 2012. "It's surreal right now, can't believe that we're here," Loyd said of advancing to Tuesday night's title game. "Glad we played the early game and can get some rest." South Carolina looked like a Final Four newcomer early, falling behind 15-3 in the first five minutes of the game. The Gamecocks settling and getting a pair of layups from Alaina Coates during a 12-4 surge that helped them get back in the game. South Carolina coach Dawn Staley has spent the past seven seasons transforming South Carolina from a struggling program into a national contender that spent much of this season ranked No. 1 in the country. The former Virginia star, who participated in the national semifinals three times as a player joined Kim Mulkey as the only women to play and coach in the Final Four, and she drew on personal experience to try to prepare her team for what encounter during its trip. The Gamecocks began to solve the multiple defensive looks Notre Dame threw at them, with Coates inflicting damage inside and Mitchell and Bianca Cuevas picking up the pace of the game once Irish guard Lindsay Allen left the game with two fouls. Wilson's jumper trimmed South Carolina deficit to 25-24, but Notre Dame wouldn't crack. Loyd delivered a three-point play during a quick seven-point spurt that helped the Irish stay in front 32-28 at halftime, then made a difficult jumper over Mitchell while drawing a foul during the 10-0 burst Notre Dame put together after Coates missed two free throws, either of which would have given South Carolina its first lead. Coates finished with 12 points and nine rebounds off the bench.